Tom Byrne - "The Eye Of The Cyclone"
The latest from Tom Byrne is the second installment in a planned multi-album epic that takes place in Britain during the dark ages. Part I was titled The Last Druids and is an instrumental portrait of the times and the principle characters Taliesin, Merlin Ambrosius, Aneirin, Llywarch the Old and Merlin the Wild. The music is based in classic progressive rock and heavily informed by Celtic folk music. Chuck wrote the review of this CD in AI #22 and compared it to Rick Wakeman, Vangelis and David Arkenstone, though to my ears it bears a strong resemblance to early Camel, The Snow Goose in particular. Another point of emphasis is that Byrne creates the music using all keyboards and electronic instruments, and listening to both these albums I have to say I'm stunned at the extent to which he succeeds in creating music that in most cases demands the inclusion of acoustic instruments (i.e., I barely noticed they were missing). Part II of the series is titled The Eye Of The Cyclone and is, as Byrne says, intended to provide an expression of the beliefs that the protagonists of The Last Druids might have held. Byrne's inspiration for the work comes from a body of writings called The Barddas, which are purported to have been compiled from the writings of the 15th century bard Llewellyn Sion. The CD is 50 minutes in length and consists of two parts. While the music is very much in the same style of The Last Druids, space rock elements are also apparent on the new album. Whereas The Last Druids was all instrumental, The Eye Of The Cyclone includes narration, and Byrne's spoken word style has a dark feel that brings Hawkwind to mind. The music has a powerful majestic progressive rock quality that also happens to be occasionally embellished by cool little freaky alien bits. These are secondary to the main themes but add a nice edge to the music that helps to give it an identity beyond that established on The Last Druids. And when the music rocks out Byrne does an excellent job of maintaining a classic prog style while injecting space rock elements into the mix. The last several minutes of Part 1 and the beginning of Part 2 are standouts in this regard. But above all, Byrne excels at thematic development and paints a lush aural landscape that transports listeners back hundreds of years to witness the time and events for themselves. Those who pine away for the glory days of prog rock concept albums will revel in Byrne's work, and it's clear he has done serious research into his subject. I'm sure some people will be picky about the keyboard representation of certain instruments. But if listeners will just allow themselves to get lost in the story and let the images of the times conjure in their minds, then I'm sure, like myself, they will be impressed with how well Byrne is able to reproduce both electric and acoustic guitars and yes... even drums. Recommended. For more information you can email Tom Byrne at: thelastdruids@hotmail.com. 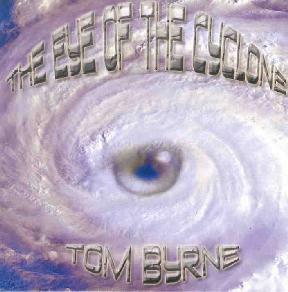 The Eye Of The Cyclone is available through CD BABY at: http://www.cdbaby.com/cd/tombyrne.